Is a Dakota R/T still competitive by today's standards? Thread: Is a Dakota R/T still competitive by today's standards? I recently bought a 99 Dakota R/T club cab and after reading and watching reviews mostly from years ago, it looks like back in the day the truck's performance was comparable to performance cars of it's time. However, moving to the present day, 20 years later, 250 hp isn't uncommon even on affordable sedans. Torque on the other hand I believe is still above average for today standards. Unfortunatelly, this is a also heavy truck. So I was wondering, what modern vehicles would a stock Dakota R/T still be competitive against as far as performance goes? As a full weight truck I would say no. There are guys that race them like Steven Dziorny who drives the McCormack Motorsports NHRA Stock Eliminator K/SA 2002 Dakota R/T, look him up. Competitive no. But looks better than anything made today. Stock? No way competitive. I think we're lucky to have the aftermarket bolt on parts that we have available. After all, it's a truck motor. 4 stud cylinder sealing and a heavy crankshaft don't make for performance. As mentioned, they're good looking trucks IMO. I feel like my stock 4wd Quad Cab Hemi truck would give my R/T (cam/heads/T56) a run for its money, but the R/T is way more entertaining to drive and turns heads unlike my belly button Ram. Best looking trucks ever made. Is not competitive with a current 5.0 mustang.but I think with decent heads and cam it becomes competitive with current offerings for not that much $ . Can’t. It’s the last pushrod v-8 from Chrysler. That’s like yanking the flat head from a 1940’s roadster and putting in a modern engine . It’ll be faster but no nostalgia. Can’t. It’s the last pushrod v-8 from Chrysler. Gen III Hemis are still pushrod motors. Dak Duh is calling you. Not quite. Late model hemis are push rod and makes power very easy. Bracket racing. It is all about being consistent with your times, and you will win. That and cutting 00 lights. But they do look good! 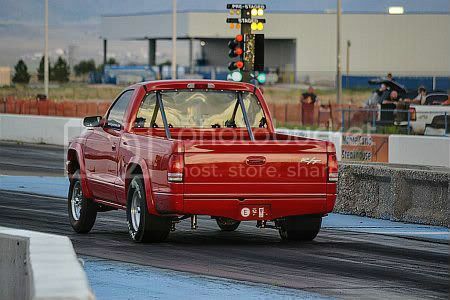 The R/T is very competitive in the “I had one of those trucks back in the day” category, right Rickysnickers? Ha. I dont even you have to give such dramatic examples. I would say 90% of new cars off any dealer lot would run down a stock dakota. Not knocking our trucks, but the efficiency they are getting out of these new cars is ridiculous. I'd love to own any of these examples but I wouldn't trade my truck for any of them. I been tryin to get learned but I don’t get the original question. Are we asking if they’re competitive with current sport trucks? That list has some badass vehicles on it. At least 5 of them are supercharged. And they all have more valve lift than than the original pimple of a camshaft that cam in the r/t . Just my blind ignorance but I think if the dakota was sold today as an art with eq heads and better cam and modern engine management it would be a competitive spot truck.